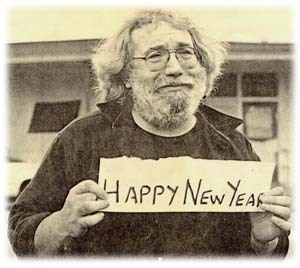 December 26, 2011 - Merry Christmas & Happy New Year! We hope that all our readers had a great Christmas with everyone hopefully spending quality time with their family and friends! Maybe there were even a few cool fly fishing related gadgets mixed into the gift giving frenzy! 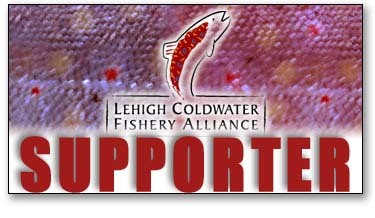 As we continue to move through the holiday season, we wish everyone a Happy New Year with big fish and hatches a plenty in 2012! December 6, 2011 - Oregon Steel! Recently one half of FFPA made it out to the high desert of Oregon in hopes of cashing in on some late-season steelhead. 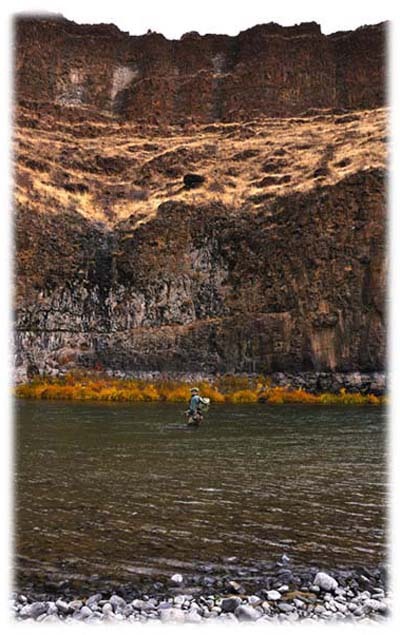 The plan was to fish the Deschutes near Maupin and near the mouth for a few days. And also hit up the John Day for a day. The John Day was a bust as supposedly all the fish were much furthur upstream from where we were fishing, and the fishing near Maupin on the Deschutes was very slow. It was not until we focused near the mouth and upstream a few miles on the Deschutes that our efforts finally paid off. Lets just say we had to work very hard for our fish. We spent all of our time fishing with spey rods and swinging deep running flies on sinks tips. All the patterns we fished had trailer hooks and were relatively large, tied as either tube flies or on a waddington shank. Colors that seemed to work best were either blue or purple. In the end to finally hook and land one of these fish in such a large brawling river like the Deschutes is killer! The scenery is incredible and the fish are beautiful. Have to also give a special thanks to Tom Larimer of Larimer Outfitters who ran us up the Deschutes from the mouth via his jet boat. Talk about a trip. 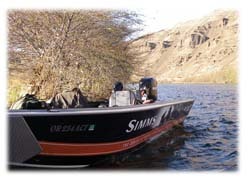 If you ever get the opportunity to take advantage of this way to get around on the Deschutes – Do It! You can cover so much water, and Tom knows his sh!t! A male and female steelhead from the Deschutes. Both are hatchery fish due to the clipped adipose. December 1, 2011 - NJ Salt! Hopefully you've had an opportunity to take in the NJ salt action. Currently it is off the charts and has been for the last few weeks. 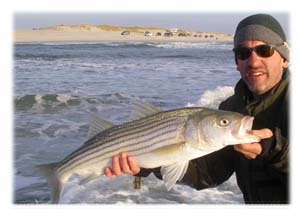 The bass are running big and have been well fed on a steady diet of large sand eels. These are the big boys - running 6" +! So these things are a meal and the bass love them! That said, we are seeing no peanut bunker at all. So fortunately we have the sand eels around. What's odd though is it was not that long ago; where the fall action was know for its peanuts. That just does not seem to be the case the few years.